My brother and I made a trip to Vegas last month on a semi-“mileage run”. We were both busy at work, so the plan was simple: We fly out Saturday morning, explore the destination, and fly back on Sunday night. I’d get some uninterrupted time on the plane to get some work done. A win-win. Now, 1.5 day isn’t really enough time if you are new to Vegas. Fortunately, it wasn’t our first visit, but it may as well be. You should never underestimate how much you can get done in a short time if you know what you want to do. I wasn’t interested in seeing shows or concerts this time around. For all the flashiness that is Vegas, I wanted to explore some free attractions on the strip. If you are looking for the same, check out these 5 family-friendly things you can do in Vegas. The Bellagio is one impressive hotel on the strip, and it is known for the “Fountains of Bellagio” shows. They run every half hour, starting at 3PM on weekdays and earlier on the weekends. The shows also run more frequently – once every 15 minutes – in the evening hours. Check out the schedule on the Bellagio’s website for the most up-to-date times. The best part is that the fountain show is choreographed to different songs. It’s especially fun when you recognize the songs. I didn’t recognize the first song, but they played the bouncy “This Kiss” (Faith Hill) the second time we passed by. I would have love to watch it with the music pairing of “My Heart Will Go On” (don’t start groaning at me now.) Side note: Since that is the second longest song choice in the list, you know what that means? A longer fountain show! Show Duration: 3-5 minutes, depending on the song. If you are strolling along the strip in the evening hours, be stop by to check out the Volcano at the Mirage. The Volcano is located outside the Las Vegas Boulevard Main Entrance. The show happens at 8PM, 9PM, and 10PM daily. The show is only a couple of minutes, so it’s over quickly enough. 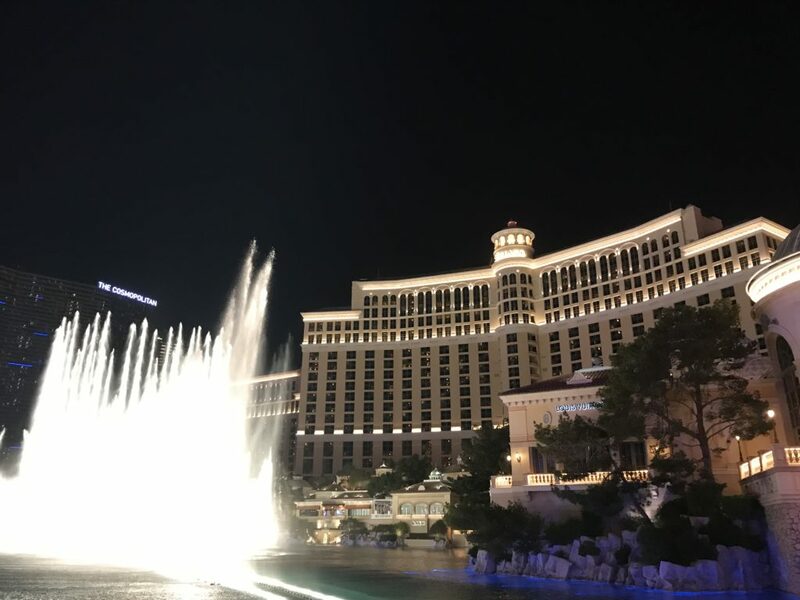 If you time it well, you can watch the show before or after the Bellagio Fountain Show. Admittedly, two things crossed my mind as I watched this show. The first was, “Wait, why am I watching a fake volcano when I’ve seen the real thing?” (An 8-miles hike in Hawaii). And, “Oh, the warmth from the fire is comforting. I hope the show doesn’t end too quickly.” It can get a little chilly in the evening during the winter time, so remember to bundle up. I don’t know if this is something people do, but hotel hopping works if you are interested in seeing the themed design of each hotel (which I was). It’d also give you a sense of whether you would want to stay at that hotel in the future. For example, I wasn’t impressed with the air quality at the MGM Grand Hotel. Or the Mirage. I loved the feel of Aria. The Bellagio was a picture of opulence, and an apparently, a popular destination for weddings. Caesar’s Palace remained unique with its Greek/Roman themed Forum Shops. Caesar’s Palace Check-In and Lobby. We didn’t even know it was happening, but there was an impressive holiday display at the Bellagio. We didn’t finish checking out some of other other hotels, but you just never know what you might find. We even found a Hell’s Kitchen. There are tons of shops at the resorts and casinos. Obviously, some of the shops will break your bank, but window-shopping is free (that is, until you see something you really like). Eating at a buffet isn’t free, unless you are some high rollers in Vegas. While Vegas is obviously known for its shows and gambling, it is home to many a good buffet options. Whether you are a foodie or not, you can spend an hour or two to enjoy some good food at a buffet. I will write more about it in a later post. If you’re looking for some ideas on where to go for buffet in Vegas, check out this list of buffet options as a start. What are some free (or cheap) family friendly activities in Vegas you might recommend? Sound off below! The post 5 Free (or Cheap) Family-Friendly Things You Can Do in Vegas appeared first on TravelUpdate.